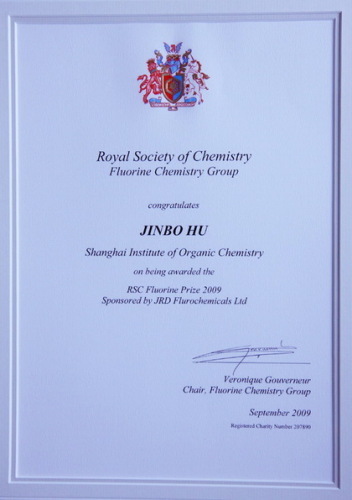 At the Royal Chemical Society (RSC), Fluorine Chemistry Group’s annual meeting at the University of Southampton during September 17-18, Professor Jinbo Hu of Shanghai Institute of Organic Chemistry (SIOC), Chinese Academy of Sciences (CAS), was awarded the “RSC Fluorine Prize 2009”. Dr. Hu gave an award lecture at the same meeting. The RSC Fluorine Prize was established by Royal Chemical Society of U.K. in 2005. The prize is a fully international award, which is not restricted to members of the RSC. The prize is awarded once every two years, which recognizes the most meritorious contribution of a younger chemist (under the age of 40) who is working in any area of fluorine chemistry, as evidenced by their published contribution. The Applicants must be nominated and should not make applications on their own behalf. The selection committee is comprised of several senior fluorine experts from different countries. Professor Jinbo Hu is the third recipient of this award. The previous two awardees are Professor Norio Shibata from Japan (year 2005) and Professor Thomas Braun from Germany (year 2007).